JAL Flyer: AIR KFC is back this winter! 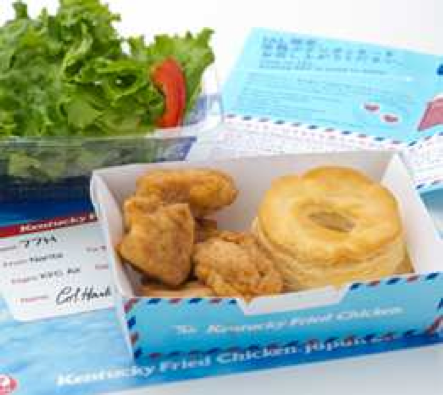 AIR KENTUCKY FRIED CHICKEN is back this winter as the 11th installation of JAL's popular AIR SERIES inflight meal. Image by Japan Airlines. Colonel Sanders is back again this winter! Last year, Japan Airlines (JAL) introduced the controversial AIR KENTUCKY FRIED CHICKEN (KFC) as the 7th installation of its popular AIR SERIES which JAL cooperates with popular restaurants and food chains in Japan to bring familiar tastes onboard for its customers. Despite some people were skeptical about serving fast food onboard, it was well-received by the passengers. That's why JAL will once again bring back AIR KFC this year to celebrate the holiday since that's what the Japanese have for the holiday. So KFC is now the third company after MOS Burger and Yoshinoya which JAL has collaborated with more than once in the AIR SERIES. JAL will continue to use the unique methods it jointly developed with KFC last year to prepare these chickens so that they taste just like those served at the stores. But JAL has upgraded this year's menu to create a brand new meal. Boneless Chicken Bites will be served with other famous sides from KFC. Image by Japan Airlines. Boneless bite size chicken called Chicken Bites will be served with other famous sides from KFC including biscuit with honey maple, coleslaw made from fresh cabbage, and the chocolate walnut cake form this year's KFC Christmas menu Party Barrel. These chickens are made with domestically produced breast meat and are seasoned with the KFC's secret 11 herbs and spices. On top of that, a salad will be served with vinaigrette dressing. So this menu is slightly healthier than last year's as it contains considerably more vegetables, although it's still a fried chicken! And you know it won't be an AIR SERIES dish without a JAL original packaging and multiple ways to enjoy the dish. This time you will see the Colonel holding a big airplane with both of his hands on the package. No idea what that meant but it's original and can only be seen on JAL flights. So other than the obvious way of enjoying the Chicken Bites and side dishes as separate dishes, you can also mix the chicken with the salad to create a chicken salad of your own. You could even add the vinaigrette dressing to bring out the freshness and taste of these chickens! 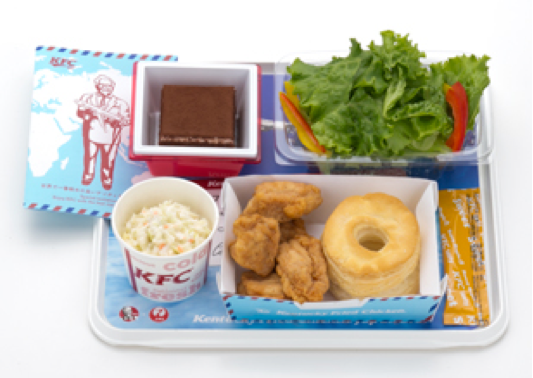 AIR KFC will be available as the second meal in Premium Economy and Economy Class on flights from Tokyo Narita to Los Angeles, San Diego, Chicago, Boston, New York, London, Frankfurt, Paris and Helisinki between December 1 2013 and February 28 2014. Hi there, I'm flying JAL in dec, i seriously dont want this air KFC lol have you ever tried the special meal? like low fat etc. ?